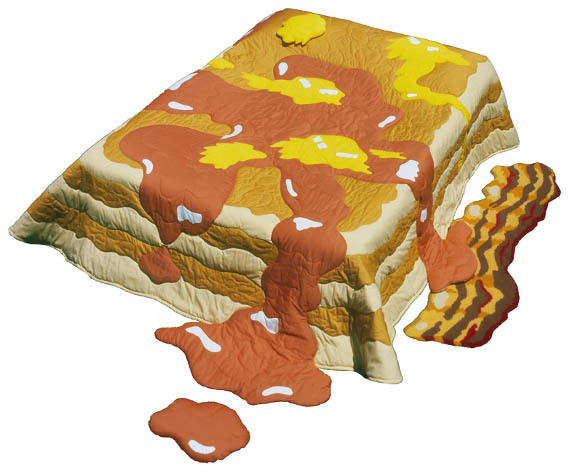 Check out this breakfasty Pancake Quilt with extra syrup PLUS bonus Bacon Rug. I wonder — does it taste as good as it looks? I’ve got food themed bedding too. Sure it’s not quite as appealing to the eye as this, but depending on where you nibble, it’s delish. There’s a candy stash in my pillow case, a slop of ketchup on my duvet that’s still ripe for the lickin’, and a layer of cookie crumbs lining the bottom sheet. You could say I’m a messy eater or you could realize that CLEARLY I’m a forward thinker. You know how many times I’ve woken up in the middle of the night, stomach growling and been thankful I had the foresight to leave that slice of pizza under my pillow? I’d say at least 6.